While he sang a woman ran out of the audience onto the stage. It was obvious she was not a threat to the performer as she had some obvious physical and mental challenges. What a great message for that woman to hear! And what a great attitude the soloist showed to a fellow human being in need of help, encouragement and care. 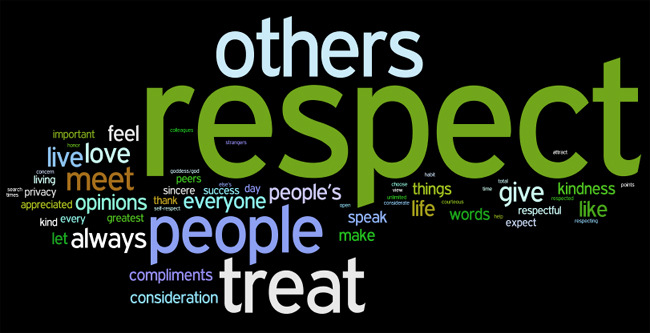 Respect involves honor, esteem, and deference to others. It values others. Treats them with dignity. And is gracious. The Bible has a good bit to say about the spirit of respect we should have toward other people in various relationships. (1) Brethren in God’s church should treat one another with respect. (2) Those in positions of governmental authority ought be accorded respect. (3) Shepherds in God’s church deserve our respect. (4) Wives are commanded to express respect for the headship of their husbands. (5) Husbands are admonished to treat their wives with understanding, consideration and respect. (6) Children must be taught to honor and respect the authority of their parents. (7) Even servants were to demonstrate respect for their masters. These passages remind us that people are important to God. And they should be important to me. People have worth. Value. Dignity. They are created in God’s image and after his likeness. In fact, the apostle Peter commands, “Respect all people” (1 Pet 2:7). In other words, show regard to others. Express appreciation. Convey kindness. No matter the social or economic status one has, he or she deserves our deference as a fellow human being with an eternal soul. I believe God wants us to look at others through heaven’s eyes. Accord them proper respect. After all in heaven’s eyes there are no losers. No hopeless cause.